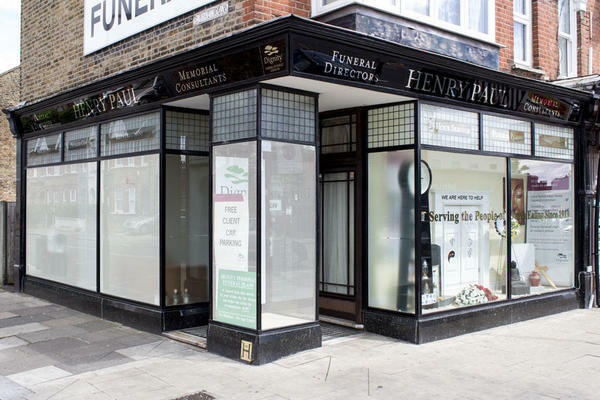 We are Henry Paul Funeral Directors in Ealing, and we have had the privilege of serving our Brentford community since 1919. We can cater for all kinds of funerals, so you can choose the most fitting service for your loved one. Our team are professionals who will listen to your needs carefully, and we specialise in Iranian, Chinese and Polish funeral services. We have our very own memorial consultants that help you choose beautiful masonry, which can stand in remembrance of your loved one for years to come. We want you to know that you are not alone, so give us a call at any hour and we will be there to help you. Call us today on 020 8567 9930 to talk through your personal requirements. There is a large car park at the rear of our funeral home. We are on the corner of Durham Road and South Ealing Road, which is a five minute walk from South Ealing Station. Our staff are available 24 hours a day on 020 8567 9930 if you require our services outside of these hours. We were very pleased with the service we were given. Nothing was too much trouble and each time we needed information, it was provided straightaway with empathy and care. This was the first time I have had to deal with arranging a funeral and nothing was too much trouble for the staff. I have no qualms in recommending Henry Paul Funeral Directors, and should I need the service again, I would be back. Thank you for taking the time to complete the online review. I am glad we were able to provide you with the support and guidance needed and we were able to help make things easier for you at such a difficult time.